At Gem, we want to help you choose a better now. That’s why we offer a range of products for you to do better! Enjoy 6 months interest free on all purchases of $250 or more,^ anywhere Visa is accepted. Whether you're after interest free offers while shopping, regular loan repayments or want to pay your loan down faster, we have the right product for you. Now that's flexible. When it comes to a personal loan, we help tailor your loan rate to you by looking at your personal information, credit history and how much you want to borrow. We work to ensure your credit card and loan payments are protected, plus our credit card Price Protection insurance means you can shop with confidence. Introducing Genoapay. Pay at partnered stores over 10 weekly instalments. Ready for some new wheels or just an upgrade? Check out our car loans. Choose a Gem Visa credit card for freedom, flexibility and access to our Gem Visa deals. Take control and get your life back with a debt consolidation loan. Wedding, travel or home renos, we’ve got you covered with our personal loans. Still have questions or need some help? Give us a call! Discover budgeting, tips and more. 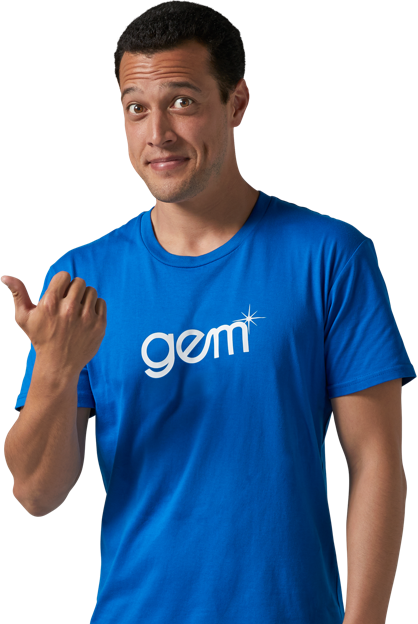 Find out more about Gem and how we can help you. Gain more control over your finances – and your life! Rates range from 12.99% to 29.99% fixed p.a. for unsecured loans. Gem Car Loan rates range from 9.99% p.a. to 19.99% p.a. for secured loans. Your interest rate depends on the amount borrowed, your personal circumstances and credit history. The interest rate and repayment amount remain the same for the life of the loan with no early repayment fee. +Credit, lending criteria & fees including a $240 establishment fee apply. Example: A Gem Personal Loan of $20,000 borrowed for 3 years with a fixed interest rate of 12.99% p.a. would equate to a total amount payable of $24,591.60 (including a $240 establishment fee). ^Gem Visa credit and lending criteria, $55 establishment fee and $52 annual account fee apply. Prevailing interest rate (currently 25.99% p.a) applies after the interest free period ends. Gem Visa is provided by Latitude Financial Services Limited. © 2016 Apple Inc. All rights reserved. Apple, the Apple logo, Apple Pay, iPad, iPad Air, iPhone, MacBook Air, Touch ID, and watch OS are trademarks of Apple Inc., registered in the U.S. and other countries. Apple Store and App Store are service marks of Apple Inc., registered in the U.S. and other countries. IOS is a trademark or registered trademark of Cisco in the U.S. and other countries and is used under license. Other product and company names mentioned herein may be trademarks of their respective companies.